A unique and unforgettable experience in a biodiversity hotspot amongst towering rainforest, thundering waterfalls and breathtaking volcanoes nestled in the Chilean lakes district set against the Andes Mountains. Aside from winning awards from National Geographic and being named one of the world’s top sustainable destinations, the Huilo Huilo Biological Reserve delivers hospitality excellence despite the remote wild location. A foundation has also been set up which runs some remarkable projects for local school children, protecting the endangered huemul (South Andean Deer), and employing local Mapuche people to help keep their culture alive through storytelling and interpretation. This diverse reserve offers something for everyone in one location – it’s not only a bird lovers’ paradise, but the geology, the flora, the diverse fauna combined with wonderful guided or self-guided treks make for endless spectacular sightseeing opportunities. Feeling a little more active? Well there’s also kayaking, white water rafting, mountain biking trails galore, horse riding, cultural visits, a lovely cultural museum and centre to explore. Wind down with a visit to the craft brewery or the spa relaxation and massage centre that rivals the best of them. If you were to try and fit it all in you would need at least five days here. The accommodation is diverse, unique and high quality, with such well thought out design and implementation. There are five extremely different lodges and another five types of accommodation choices offering everything from camping, hostel, glamping, cabins, mid-range to the luxurious high end where you can hear the thundering water from your balcony as the birds are singing. With over 200 square miles of Valdivian forest, many beaches, lagoons, volcanoes, hot springs, lakes and waterfalls it offers privacy, serenity, you can stay in any of the accommodation options and not feel crowded by other tourists. Whilst it is rather a magical destination for families and children, with the Montaña Mágica Lodge and the fairy’s hidden amongst the premises, it is also the perfect escape from the world for couples or groups of friends. They can enjoy the nature, comfortable surrounds, amazing food and wine and be as active or relaxed as they want in a holiday. Whilst it is only a few hours’ scenic drive from Temuco Airport or Puerto Montt, I highly recommend a scenic detour to San Martin just over the border in Argentina – this scenic two hour drive and wonderful 90 minute ferry across a beautiful lake made it one of the most memorable transfers I have experienced in south America. 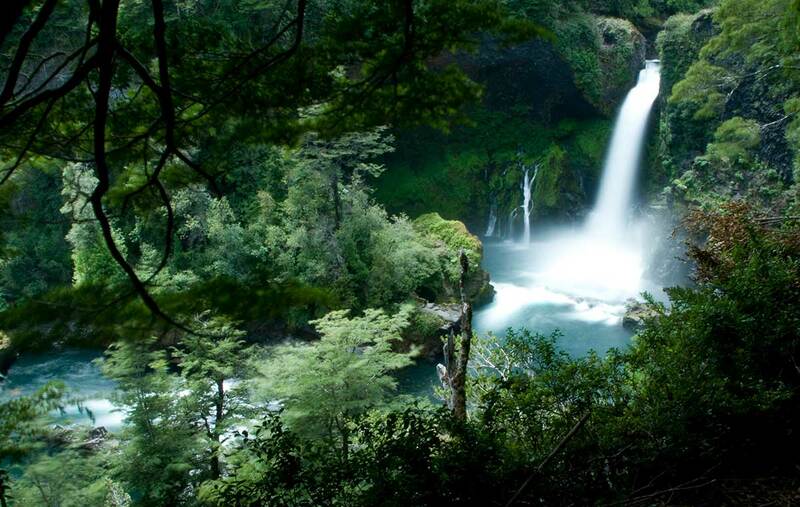 With luxurious accommodation options and a wide range of activities and amazing scenery all in one location Huilo Huilo is a great option to experience this remarkable part of the world without long day tours, avoiding the crowds as they limit the number of guests to the reserve each day. This is so different to the other areas of Patagonia I have experienced that you should seriously consider this as an addition and not an alternative to Torres del Paine. You can see the Patagonia tours we offer here.